The consensus among everyone who took part in it is that the USS dispute was a fight over the future of Higher Education, not simply over the pension scheme. The reason is simple. The undermining of Higher Education by its supposed leaders has reached a critical point. The 2017 Higher Education and Research Act (HERA) accelerated the drive towards the fragmentation of the system and full privatisation. Mass redundancies announced at OU, Liverpool, Westminster and London South Bank are one sign of this process. Another was the threat by Cambridge and Oxford to go it alone. As one commentator put it, the USS crisis was Made in Westminster and driven by HE marketisation. Our USS dispute galvanised this opposition to the attack on Higher Education. The Big Picture politics united professors and post graduates, irrespective of whether they personally had a pension or were close to retirement. The formation of the Joint Expert Panel (JEP) to review the current valuation of the USS pension scheme, and the wider methodology for future valuations, has the potential to be an important step in limiting competition between employers, provided that the deficit is reduced and especially if the Government is forced to step in and guarantee the sector and the pension scheme long-term. If this happens then the employers will have an incentive not to leave USS. In the short term, increasing costs on employers will restrict their ability to engage in expensive capital projects in the race for student numbers. But it may also cause them to quit USS, or like Coventry, expand by hiring staff in subsidiaries without access to the pension scheme. The employers’ marketisation agenda is based on the assumption that students will continue to take on unsustainable levels of personal debt (and the Treasury will continue to write a blank cheque) in their desire for a decent education. Competition will intensify post-Brexit if EU student numbers fall. If the JEP delivers a resounding rejection of the USS valuation, this can be the start of a wider defence of HE. However, the JEP will not do this unless the power that brought the employers and the USS Board to heel continues to be felt. It was our 14 days of strike action that stopped the imposition of 100% Defined Contributions, and it is only the threat of future strike action that can ensure the JEP delivers for UCU members. This is one of two key reasons why we now have to immediately mobilise for strike action in the autumn – not just to prevent backtracking over USS, but also over pay. Graph: Real-terms HE Pay/Salary Cost to August 2017. 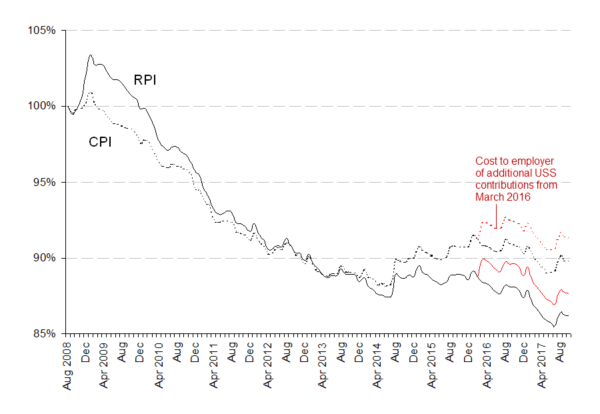 August 2008 = 100%, estimated against RPI (solid line) and CPI (dotted line). The red line is the Salary Cost to USS employers after March 2016 when the paid an additional 2% into USS. Data from Office for National Statistics. The employer’s UCEA proposal for a 2% rise in pay is derisory. It could amount to the biggest real-terms cut in pay in one year since 2008. Pay is currently around 13% less in value than in 2008. RPI in March was 3.3%, equating to a further 1.3% pay cut for 2018. On top of this, there is the risk that if the JEP does not deliver, USS members in pre-92 will have to pay additional contributions of 3.7% of salary. A “2% pay increase” is increasingly looking like a 5% pay cut. Our pay campaign must embrace the demand for No Detriment in pensions as well as pay. We should not be paying for the failures of USS and the employers or their marketisation agenda. The USS strikes focused attention on the inequalities in HE. Vice Chancellors have been granting themselves eye-watering pay increases. The Minister for Higher Education, Sam Gymiah MP, was forced to legislate that Vice Chancellors and Principals can no longer sit on remuneration committees that determine their pay. You really have to take corruption to new heights to have to have a Tory Government Minister to say that your greed has to end! But it is not simply Vice Chancellors’ and Principals’ pay that is a disgrace. A host of other ‘perks’ demonstrate they have lost touch with the reality of life for staff in the institutions they run. When the new Principal at Edinburgh University, Peter Mathieson, moved from Hong Kong University, he was awarded an £85K increase in the salary of his predecessor (to bring his basic salary to £342K). He received approximately £42K in lieu of pension contributions, £26K in relocation costs and – just to make him comfortable – he was given a ‘grace-and-favour’ five-bedroom home in central Edinburgh to live in. The second reason why we now need a serious militant fight over pay is that our USS dispute was driven by the experience of staff facing the intensification of workload and managerialism, and the twin evils of discrimination and casualisation. Our pensions dispute was never going to resolve the scandal of casualization, nor the scourge of gender, and other, pay gaps – but the pay campaign can take the fight to the employers. As Christina Paine and Sue Abbott, separately in this volume [Another Education is Possible], make clear, casualization and pay discrimination over gender and other protected characteristics are structurally embedded in HE. Mobilising the enthusiasm evident over the USS pensions dispute across both pre- and post-92 universities on pay can mean we utilise the power we have in our membership to demand real action on casualization and pay discrimination. The pay campaign can resolve the unfinished business in our USS dispute. We can also unite with colleagues in Further Education beginning a national fight over pay. Indeed, we are not alone in the working class movement in seeking to mobilise a wider campaign over pay. Already Mark Serwotka, General Secretary of the PCS union, is calling for a national strike over pay. Together with PCS and other unions such as NEU and EIS, we could co-ordinate strike action for an end to the pay squeeze and an end to inequalities in the public sector. Our USS dispute has given confidence to workers well beyond our ranks. It demonstrates that British unions are far from finished, they can overcome barriers placed in their way by anti-union laws, and they can renew their membership and win real improvements for their members. But that will only take place by leading a serious fight to stop our pay being cut, and end casualization, discrimination and inequality. First published in Another Education is Possible, UCU Left, Spring 2018.